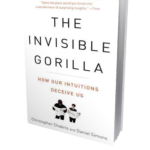 The Invisible Gorilla: How Our Intuitions Deceive Us - Jon Lieff, M.D. This is an excellent book about the vagaries of the mind, in the tradition of Daniel Schacters book, The Seven Sins of Memory. The original “gorilla” experiment is now very famous, but the broad implications about the unconscious processes in our brain and mind triggered by experiments like this are only now being investigated. The book elaborates on six important illusions of the mind. The gorilla reflects the illusion of assuming the ability to see all that goes on. The research into the illusion of memory also demonstrates that eyewitness testimony can be very inaccurate, a finding that is now beginning to change how court systems operate. Other illusions include one where people think they know more than they do, and the common illusion about being able to infinitely multitask with multiple gadgets. The book also describes the problem of proving causation when observing a sequence of events. The media often make rapid assumptions of causation both in reporting incomplete scientific data, or causes of events in society and economics. The authors outline limits on the exaggerated claims of the power of the mind.